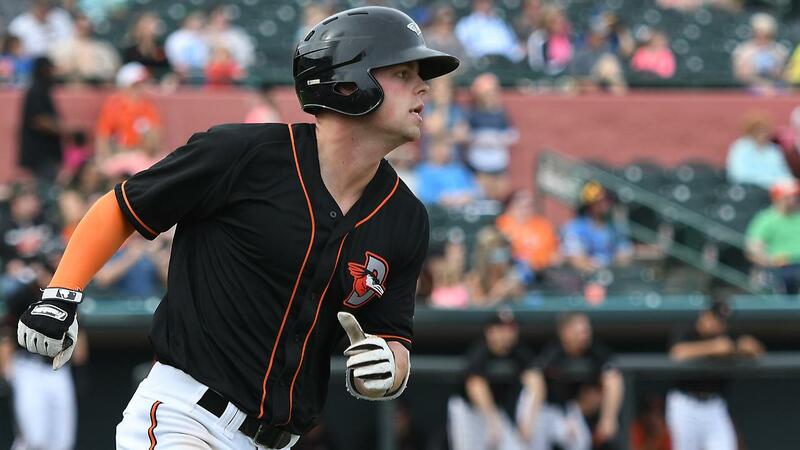 SALISBURY, MD - Not even 24 hours after their remarkable ninth-inning comeback win, the Delmarva Shorebirds came from behind in more conventional fashion to win their sixth straight, beating the Lakewood BlueClaws 6-5 on Sunday afternoon at Arthur W. Perdue Stadium. With the Shorebirds (8-1) down 5-2 in the sixth, Adam Hall rolled a single to the right, beating the BlueClaws' (3-8) shift. Jean Carlos Encarnacion then beat out his own infield hit, and Hall took third on a throwing error. That brought up Will Robertson, who powered a line drive down the left field line and over for a three-run homer, his first of the year, to tie the game at 5-5. Delmarva took the lead for good in the bottom of the seventh. With two out and nobody on, Andrew Fregia laced a single into right center for his long-awaited first hit of the season. Fregia then stole second base and went all the way to third when second baseman Jonathan Guzman dropped the throw from the catcher. With the go-ahead run 90 feet from the plate, Cadyn Grenier took advantage of another Lakewood overshift, shooting a grounder to the same spot that Hall did an inning prior and into right for a base hit. Fregia scored with ease to put the Shorebirds up for good at 6-5. Matt Hammonds pitched a scoreless eighth for Delmarva, striking out three, to provide a bridge to Tim Naughton in the ninth. Naughton walked a man with two out but got Guzman to roll out harmlessly to first to end the game and finish off the four-game sweep. Tyler Joyner (2-0) earned the win in relief for the Shorebirds, going three scoreless innings, albeit with two inherited runners scoring on his watch, walking none and striking out five. Ethan Lindow (1-1) took the loss for the BlueClaws after giving up four runs over four innings in relief. Naughton's save was his second in as many opportunities this season. After waiting until the ninth to get their first hit the previous night, the Shorebirds got the first one out of the way early as Robertson led off the second with a single. Ben Breazeale followed with a base hit of his own, and Robertson came around to score on back-to-back fielder's choices by Seamus Curran and Doran Turchin. Branden Becker followed and golfed the first pitch into left for an opposite-field double, scoring Turchin to make it 2-0 Delmarva. The BlueClaws got both of those runs back in the third on a two-run homer by Alec Bohm. The blast was the first of the season for the No. 1 Phillies prospect, as well as the first of the year for the entire Lakewood team. In the fifth, Lakewood chased Delmarva starter Nick Vespi from the game. Matt Kroon, Yerwin Trejo, and Guzman managed back-to-back-to-back singles to load the bases with nobody out. Malvin Matos drew a walk to force in a run and send Vespi to the showers. Joyner came in, gave up a sac fly to Bohm, and threw a wild pitch to let Guzman score, putting Lakewood up 5-2. Vespi allowed five runs on six hits in four-plus innings in a no-decision, walking four and striking out one. BlueClaws starter Colton Eastman faired better, leaving after five innings of two-run, three-hit ball in line for the win until the Shorebirds came back against Lindow. Robertson finished 2-for-4 with a homer, two runs, and three RBIs from the Shorebird cleanup slot. Hall went 2-for-4 with a run scored. Bohm went 2-for-3 with a home run, sac fly, and three driven in for the BlueClaws. Kroon had two hits and scored a run, while Trejo went 1-for-2 with a pair of walks, a stolen base, and two runs scored. With co-leaders Hickory rained out against Kannapolis, the Shorebirds finish the first full week of the SAL season alone in first place in the Northern Division. The Shorebirds take aim for lucky No. 7 in Monday night's series opener against the Kannapolis Intimidators. In a rematch of last Tuesday's game, Ofelky Peralta (0-0, 1.93) gets the nod for Delmarva against Kannapolis starter Kade McClure (0-0, 0.00). First pitch is set for 7:05 p.m. with gates opening at 6:00. Monday is the season's first 47 ABC $3 Monday presented by Wicomico Heating & Air at Perdue Stadium. Pregame coverage on Fox Sports 960 AM and the MiLB First Pitch App beginning at 6:50 with Will DeBoer on the call.